POLL: Should a person’s religious beliefs – as NHS Trust director or prime minister – affect their politics? Richard Page says televised remarks opposing gay adoption stemmed from his Christian faith [Image: Matthew Walker/SWNS.com]. It is interesting that Richard Page’s claim to have suffered religious discrimination over his Christianity follows Theresa May’s claim that her own Christian beliefs are informing her conduct regarding Brexit. This Writer’s opinion is that it is right that Mr Page should have been sacked as a magistrate and as a director of an NHS trust if he was allowing his religious bias to override the value of the evidence that was put before him, as he carried out those roles. A former director of an NHS trust is suing Jeremy Hunt for religious discrimination after he was effectively barred from applying for positions following his public opposition to gay adoption. 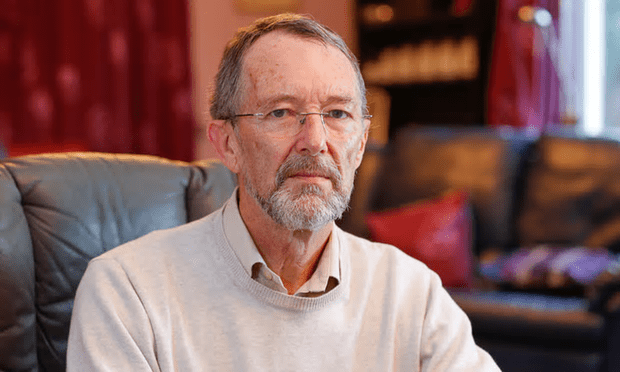 Richard Page has lodged a claim at the employment tribunal, saying his televised comments in 2015 that it was in the best interests of a child to have a mother and father stemmed from his Christian faith. His remarks led to him being sacked as a magistrate in March for serious misconduct, after 15 years on the bench. Two years earlier, the lord chancellor and lord chief justice reprimanded Page after finding his religious beliefs, rather than evidence, had influenced his decisions during a family court hearing. Page, 70, was also a non-executive director at the Kent and Medway NHS and social care partnership trust. In March, following a complaint by the trust’s LGBT staff network, Page was suspended for the final three months of his four-year term in office. In August, the NHS Termination of Appointments Panel told Page “it was not in the interests of the health service for you to serve as a non-executive director in the NHS”, in effect barring him from applying for directorships in the future. Page, a former NHS manager from Headcorn, Kent, is bringing a claim against the health secretary and NHS Improvement, which has the power to appoint non-executive directors. He is pursuing a similar case against the lord chancellor over his sacking as a magistrate. That is a difficult one for an atheist to answer Mike. I have a strong mistrust of bigoted religious people of any so-called “faith”. People of faith could turn that argument right back on atheists, though. Far be it for me to side with Jeremy Hunt (!) but I used to be the headteacher of a C of E Primary School. The diocese under the Bishop of Guildford was always completely clear that the first function of any school whether faith based or not, is to educate. The principles of your profession are what you sign up to when you take the job. You do your best to adhere to your christianity, but you have to also adhere to your contract with your employer and the law of the land. If your religious principles get in the way of you doing your job and you cannot resolve it, you need to leave and do something else! I doubt Jeremy Hunt has much to do with this. I’m no atheist but I certainly don’t believe anyone should let their religious beliefs interfere with the correct execution of their duty – whether they are Richard Page or Theresa May. But then, I don’t believe anybody’s religious beliefs should include prejudice against people for legitimate life choices. If I had been adopted by a gay couple or 1 parent, my life might have turned out differently, for One, I would have been loved, instead of going through the hell I went through! It is not his job to be other people’s conscience. When I was ten, I was taught RE by a teacher who thought it was appropriate to throw a solid wooden blackboard eraser at his students head, if they dared to have a different opinion. If religion is Not part of the job description, then it should be left out of the job. After all isn’t religion a personal guide? I am probably wrong so please don’t take any offence? You’re not wrong Joanna and I hope life is better for you now. Interesting to see your comment about RE teachers. They are supposed to educate and not indoctrinate. Sounds like you had a bad experience at school as well. If I had been an RE teacher I would have taught students to question what they are taught in that subject, because in questioning, that leads to discovery of their own personal beliefs. My major concern is that atheistic/PC bigotry has taken over from old fashioned religious bigotry. They both take a totalitarian approach to social engineering, so what is the difference? With regard to this particular man, I know nothing about the case, but if his only crime is to express an opinion about the desirability of having bi-gender input into a child’s upbringing, I cannot understand the hysterical response. Any psychiatrist worth their salt will tell you that both sexes bring something valuable and different to the process of bringing up a child, and that being a single parent is very hard because of the need to try and fulfil both gender roles. I am certainly not saying that gay couples shouldn’t be allowed to adopt or foster, and I am sure that many of them would do a splendid job. This man would probably go further than me and reject that assertion, but I think he is entitled to his opinion. People are becoming less and less tolerant of divergent views, and as a result we are not cultivating the capacity to have an adult respectful debate. Of course this ‘divide and rule’ tactic plays right into the hands of the elites. Why cannot they just adopt the solution that the man does not rule in cases involving gay people? Ultimately it is in all our interests to promote social harmony and demonising one or other group is not going to help us. Does the point made about his failure to demonstrate good judgement/execution of the law answer your query regarding objections and arguments made in response? By ‘hysteria’ I meant strong condemnation and talk of banning and exclusion. I believe the word hysteria is merited as it is a violent reaction to something which is ultimately not a major crime – just the expression of an opinion. People have become so ridiculously thin-skinned and intolerant that they cannot even stand to hear different opinions expressed without frothing at the mouth. What this reveals is that people no longer believe in the concept of free speech – they only pay lip service to it. By all means let the man be removed from evaluating cases where his conscience may present problems, but there is no need for the collective castigation. It is not as if there aren’t really important outrages going on in the world, which are usually ignored because they have become part of our normality. It is symptomatic of a complete loss of perspective. Perhaps those expressing such outrage should remember that at one time their own views would similarly have been violently condemned. Society progresses through toleration, not through the opposite. This is not to say that there should not be limits to free speech. Anything which involves violence and manipulation of the weak and vulnerable should not be tolerated. Some people may even say that even these limits to free speech are undesirable – they are my personal limits, but others may disagree. I had both a mother and father, during my first 4 years of life they abused me horrifically!!! They starved, me smashed my feet with a hammer and burnt me with cigarettes, later on they did much worse. They were both heterosexual. To me it doesn’t matter if parents are gay or straight as long as there is love, compassion and respect! And no the response isn’t hysterical, that man should know better than to ignore the law in favour of his personal opinions. I tend to agree with most of what you are saying, but as a magistrate belief is not an option, it is the laws and the facts that matter, if you deviate from that approach you are not behaving in a fair and even handed way, any bias whether it is based on beliefs, economics or any other variable, is not acceptable. Not a lot o chance of him winning, the rule of law must come before belief, why, because belief is just that, belief. Do you remember IDS saying “believe” to his homicidal policies? Belief has no connection with evidence of facts, he ignored that and killed thousands of people. This magistrate might have ruined lives as well. There is nothing hysterical about a reprimand and being fired because you can’t, or don’t want to recognise the difference! Why the heck was he ever “in post” in the first place. Bigots such as Richard Page should automatically be disqualified from holding Senior Office in such institutions, especially if their religion is the guiding star in any decision making they are involved in. No person can claim their beliefs do not affect their thinking about anything put before them. If you mean should a person have the right to have religious beliefs which of course the answer must be yes then why would the same person be asked to behave as ‘some other’ person might? I share the possible intention of the author but this is credulous reasoning. The plain argument must be we reject prejudice of any kind. If our colleagues in any walk of life wish to refer to their beliefs as a basis for avoiding their duty and persecuting others, then they must be advised they are not doing their duty according to the governance relevant setting-the law/agreed procedures/agreed conventions etc. People must entitled to their views but they cannot also be entitled to position or power if they abuse that responsibility. If the facts are correct this guy has failed to do his job and has acted in a arbitrary and highhanded way. You raise a good question. Perhaps a better way would be for the person whose beliefs conflict with what they’re being advised to do to speak up about it and have a discussion with their fellows. Then it may be possible that they could be persuaded to do the logical thing? If my own beliefs conflicted with advice when I was being asked to make a judgement, I think I’d want to talk it out. my local MP refused to support peaceful termination for those at end of life on the basis that it was against his religious belief. He did however follow his fellow Con lemmings and vote against it….would have preferred he had not voted at all. People who believe in talking snakes and men living in fish, or great floods that cover the earth should never be allowed anywhere near the levers of power as they are obviously deluded. If you honestly believe that’s what Christianity is about, then you should probably be kept away from responsibility too. As a redoubtable poll denier, Mike, I’m surprised you’re holding one of your own since, according to you, polls don’t accurately reflect the status quo and therefore are meaningless aren’t they! Why shouldn’t I run polls? The results will be just as valid as if they were done by one of the polling companies. Also, I don’t deny the polls that count – election results.